Maltodextrin, Citric Acid, Natural & Artificial Fruit Punch Flavor, Silicon Dioxide, Sucralose. Not for use by individuals under the age of 18. Consult a physician or licensed qualified health care professional before using this product if you have or have a family history of heart disease, thyroid disease, diabetes, high blood pressure, recurrent headaches, depression or other psychiatric condition, glaucoma, difficulty in urinating, prostate enlargement, or seizure disorder, if you are using a monoamine oxidase inhibitor (MAOI) or any other dietary supplement, prescription drug or over-the-counter drug containing ephedrine, pseudoephedrine or phenylpropanolamine (ingredients found in certain allergy, cough/cold, and weight control products). Discontinue use and call a physician or licensed qualified health care professional immediately if you experience rapid heartbeat, diziness, headache, shortness of breath, or other similar symptoms. Individuals who consume caffeine with this product may experience serious adverse health effects. Improper use of product may be hazardous to a person's health. KEEP OUT OF REACH OF CHILDREN. Maltodextrin, Citric Acid, Natural & Artificial Grape Flavor, Silicon Dioxide, Sucralose. Use daily for best results. Mix 1 scoop with 10-12 oz. of water. Drink 30 minutes prior to exercise. Not for use by individuals under the age of 18. Consult a physician or licensed qualified heath care professional before using this product if you have or have a family history of heart disease, thyroid disease, diabetes, high blood pressure, recurrent headaches, depression or other psyciatric condition, glaucoma, difficulty in urinating, prostate enlargement, or seizure disorder, if you are using a monoamine oxidase inhibitor (MAOI) or any other dietary supplement, prescription drug or over-the-counter drug containing ephedrine, pseudoephedrine or phenylpropanolamine (ingredients found in certain allergy, cough/cold, and weight control products). Discontinue use and call a physician or licensed qualified health care professional immediately if you experience rapid heartbeat, dizziness, headache, shortness of breath, or similar symptoms. Individuals who consume caffeine with this product may experience serious adverse health effects. Improper use of product may be hazardous to a person's health. KEEP OUT OF REACH OF CHILDREN. Maltodextrin, citric acid, natural and artificial flavors, silica, sucralose. Not for use by individuals under the age of 18. Consult a physician or licensed qualified health care professional before using this product if you have or have a family history of heart disease, thyroid disease, diabetes, high blood pressure, recurrent headaches, depression or other psychiatric condition, glaucoma, difficulty in urinating, prostate enlargement, or seizure disorder, if you are using a monoamine oxidase inhibitor (MAOI) or any other dietary supplement, prescription drug or over-the-counter drug containing ephedrine, pseudoephedrine or phenylpropanolamine (ingredients found in certain allergy, cough/cold, and weight control products). Discontinue use and call a physician or licensed qualified health care professional immediately if you experience rapid heartbeat, dizziness, headache, shortness of breath, or other similar symptoms. Individuals who consume caffeine with this product may experience serious adverse health effects. Improper use if product may be hazardous to a person's health. KEEP OUT OF REACH OF CHILDREN. Maltodextrin, Citric Acid, Natural & Artificial Flavor, Silicon Dioxide, Sucralose. Maltodextrin, Citric Acid, Natural & Artificial Watermelon Flavor, Silicon Dioxide, Sucralose. 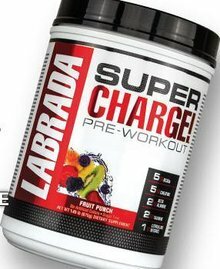 Aug 28, 2015 Labrada Super Charge: New 2015 Version! For Labrada Nutrition founder Lee Labrada, developing the most effective sports nutrition supplements is a passion. Lee brings the same pursuit of excellence to the design of his sports supplement line that he did to developing his classic, world-renown, Bodybuilding Hall of Fame physique. What makes NEW Super Charge! the BEST pre-workout supplement available today? Super Charge! contains EFFECTIVE AMOUNTS of 10 performance enhancing ingredients. Super Charge! DOES NOT CONTAIN ineffective sprinkles of active ingredients, which is common in some pre-workout formulas containing proprietary blends. Super Charge! gives you effective amounts of performance enhancing active ingredients, so you get GREAT workouts and GAINS in strength, endurance, mental focus, and recovery. Super Charge! is designed to optimize and enhance your strength, endurance, mental focus and recovery so you can push through your workouts with greater drive and motivation.